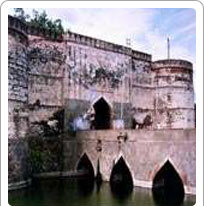 Lohagarh (literally Iron Fort) was built by the Jat ruler Maharaja Suraj Mal. This is among the strongest forts ever built in Indian history. The British also beat a retreat after laying siege to the fort for six weeks. As a matter of fact, the British laid siege four times but each time had to retreat unsuccessfully. One of the gates of the fort has four pillars and is called Chowburja while the other is made of Ashtadhatu (eight metals). The Ashtadhatu gate has paintings of elephants on it. This gate of Lohagarh has interesting history associated with it. Originally it belonged to the Fort of Chittaurgarh. Sultan Alauddin Khilji of Delhi after an attack but the gate was brought back by Jat army after victory and placed in Bharatpur. This fort is not flamboyant but is quite magnificent and has an air of strength. There is also a moat surrounding the fort. There are several monuments of tourist interest inside the fort, viz. Kishori Mahal, Mahal Khas and Kothi Khas. Moti Mahal and the Jawahar Burj and Fateh Burj towers were erected to commemorate the victories over the British and the Mughals.